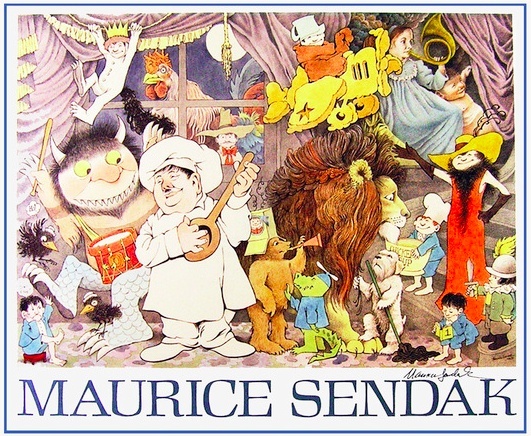 Today’s post is in honor of Maurice Sendak, prolific artist, illustrator, and author. 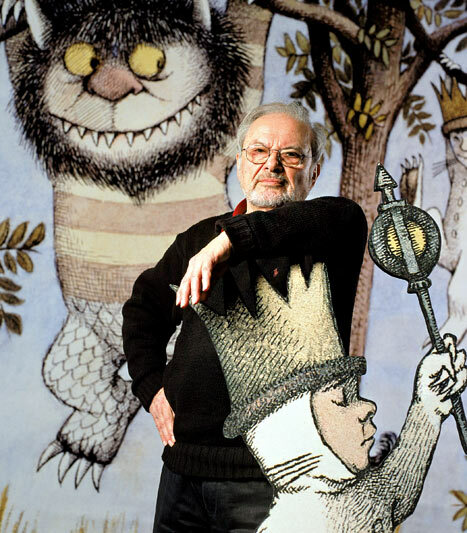 Sendak is best known for his book Where the Wild Things Are, first published in 1963. He is from Brooklyn, NY and was born to Jewish-Polish immigrant parents. During his childhood several of his family members were still in Europe and died during the Holocaust. He decided to become an illustrator after viewing Walt Disney’s film Fantasia at the age of twelve. To read a more complete life story and obituary, go to the New York Times, HERE. 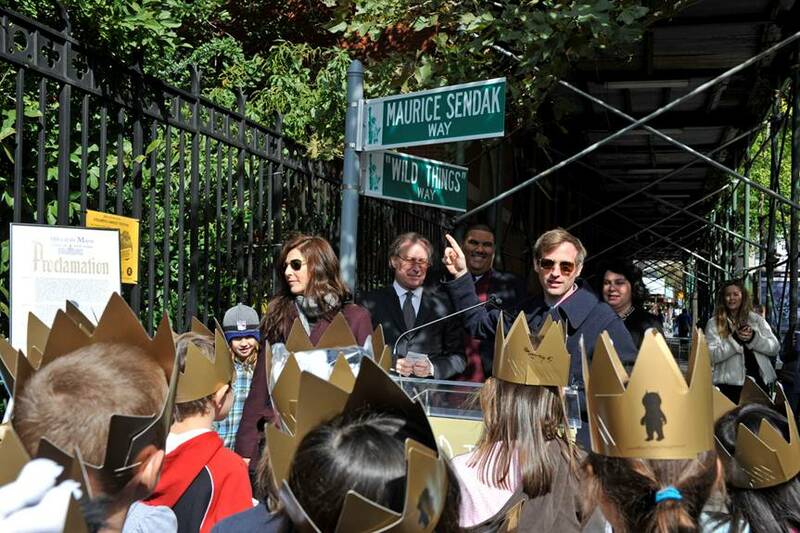 Actress Catherine Keener and director Spike Jonze on Maurice Sendak and Wild Things Way. The intersection commemorates where the book was written in Greenwich Village. 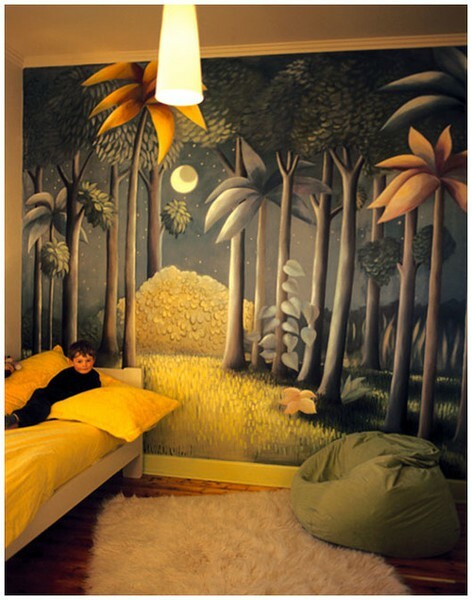 Wednesday, October 14th, 2009 was officially declared “Where The Wild Things Are Day” in New York City. Photo by Julienne Schaer courtesy of NYC & Company, found HERE. He has been quoted, during a PBS Interview, as saying, “My gods are Herman Melville, Emily Dickinson, Mozart. I believe in them with all my heart.” Elaborating further, he has explained that reading Emily Dickinson’s works helps him to remain calm in an otherwise hectic world: “And I have a little tiny Emily Dickinson so big that I carry in my pocket everywhere. And you just read three poems of Emily. She is so brave. She is so strong. She is such a passionate little woman. I feel better.” His work is just weird enough to be off-kilter! 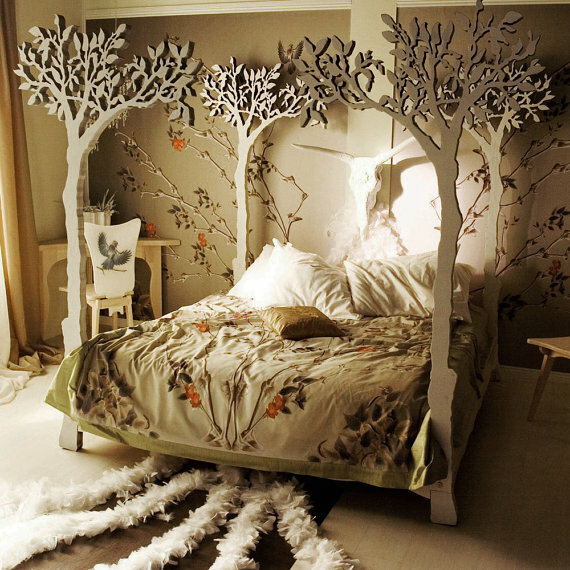 An organic and tree based canopy just like Max would have! Found HERE. 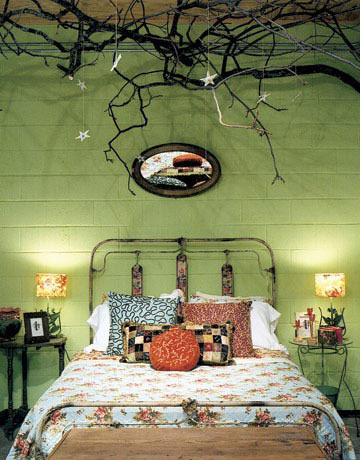 Max can’t have all the fun, here’s a room for the Maxine in your life. 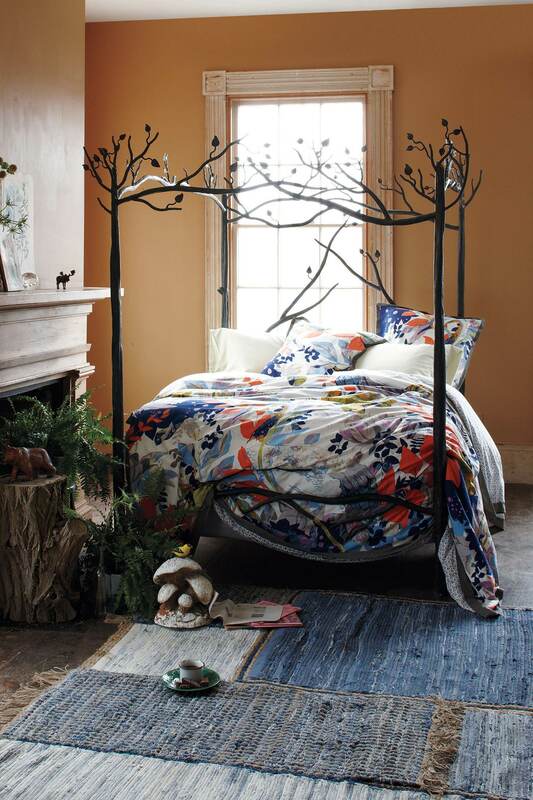 Under the apple tree canopy bed features a modern romantic Scandinavian design from Sleep Therapy. I would feel like a fairy or nymph in this woodland fairy tale scene. Image found via Etsy, HERE. Found in Belsay Hall in Northumberland. In 2007, the abandoned Belsay castle housed an exhibition called “The Picture House”. Artists, film directors, actors and musicians were invited to fill Belsay Hall’s empty rooms with installations to delight and amuse the visitor. 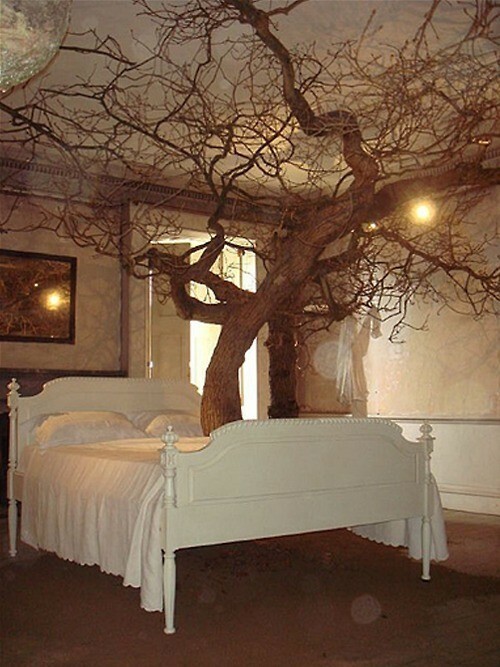 The above image is from Geraldine Pilgrim who imaged a tree growing directly through a bed. In his New York Times obituary it is noted that Sendak’s work was the subject of critical studies and major exhibitions (recently at The Jewish Museum, in NYC); in the second half of his career, he was also renowned as a designer of theatrical sets. His art graced the writing of other eminent authors for children (Little Bear) and adults, including Hans Christian Andersen, Leo Tolstoy, Herman Melville, William Blake and Isaac Bashevis Singer. 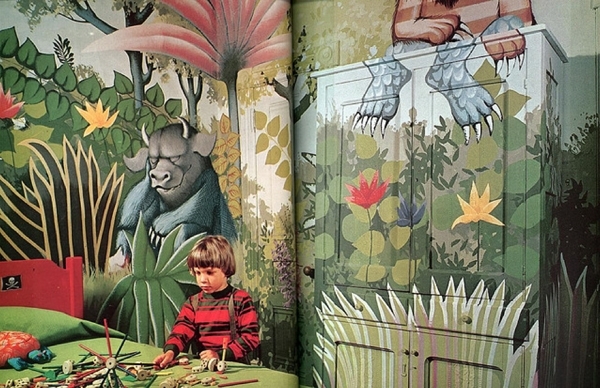 In the 70’s some really hip parents allowed this fantastic Where The Wild Things Are room-sized mural. The paint even camouflages the door and armoire! 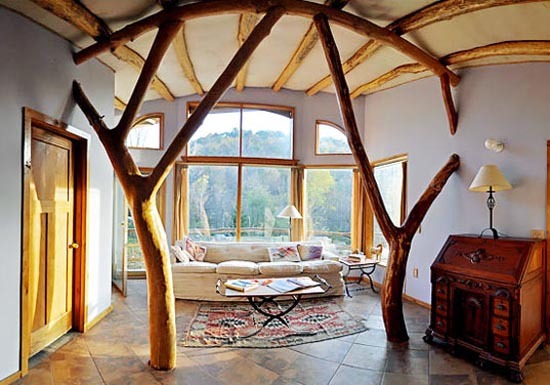 Whole tree architecture is a form of building refined by Roald Gundersun that works with the local ecology and economy to allow buildings to be sustainable. To read more go HERE. Designed by Turkish Designer Asli Tunca. 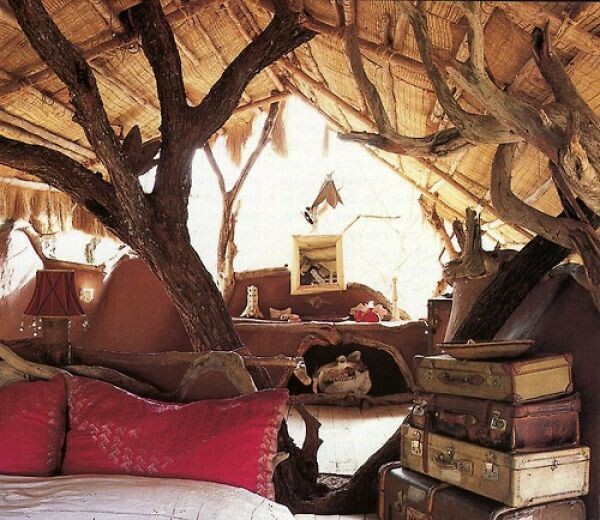 Oh, to build a childhood fort, to live in a secret and private treehouse! Must have a password to enter and NO BOYS ALLOWED. Image found HERE. 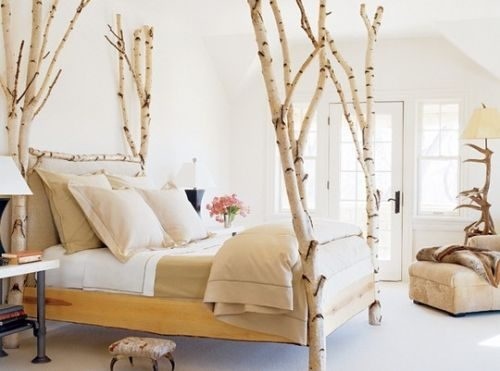 Or perhaps you like your tree canopy beds to be pine wood and a bit more minimal and sophisticated? Image found HERE. His work was dark, mangled, odd and yet somehow gentle and nostalgic. 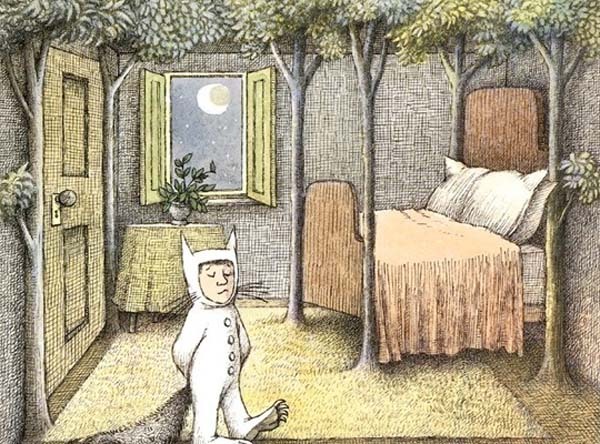 He Sendak grew up lower class, Jewish, and gay — permanently shunted to the margins of things. His images and text both celebrate and chastise humanity – the judgement on those with AIDS, the expectations of childhood, homeless children, the anxiety of separation and loss during childhood, and the dingy nightsscapes of New York. 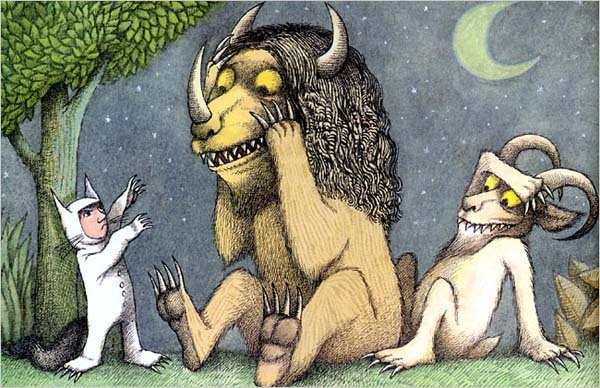 Sendak explained all with a sense of sharp humor, surrealism, observations, and imagination. His work has touched millions of children, adults, and those in between. 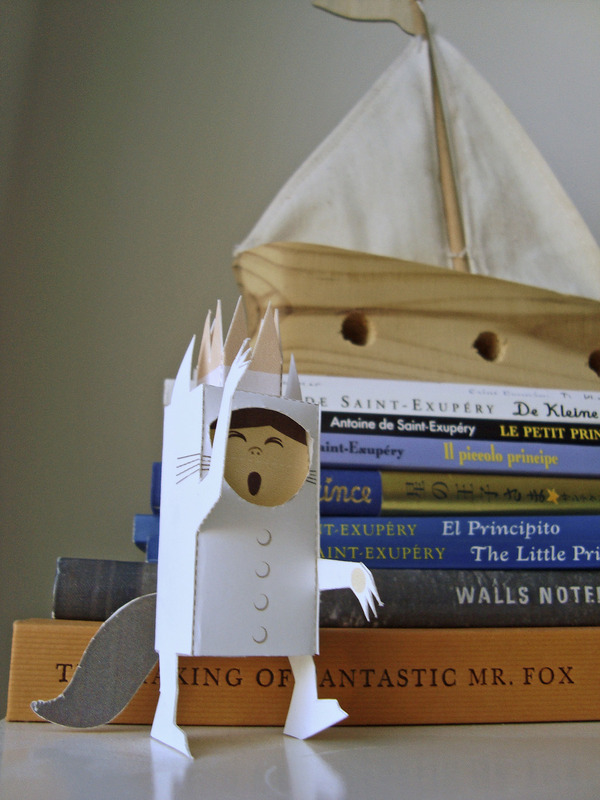 Let the wild rumpus never end! Sendak explains, “And it is through fantasy that children achieve catharsis. It is the best means they have for taming wild things”, perhaps through a fantasy room of our own we can tame our “wild things” as well. NOW HOW TO TAME THESE THINGS AND LIVE IN A WILD RUMPUS?